Municipal rules may not allow it, but that isn’t stopping Rob Ford from pushing to have his brother Doug fill in for him on council while he recovers from his cancer operation. The Ward 2 councillor says he expects to be away for four months following the May 11 surgery and told CP24 Saturday that he plans to talk to the city’s lawyers as well as City Manager Joe Pennachetti to figure out how his brother can take over his council responsibilities. “People are used to my sort of customer service and that is going right to their front door. My brother knows what I expect, he knows the constituency, he represented Ward 2,” Ford said. “I believe we should amend the procedural bylaw if we could and have Doug step in. Just let him do the work for four months. He can go to committees, he can go to council, he can do exactly what I can do,” Ford said. Speaking to CP24 Friday night, lawyer John Mascarin, who specializes in municipal affairs, said as it currently stands, a council member cannot appoint someone to act on their behalf, even on a temporary basis. “Technically it may be possible but in a very different way than I think the Fords anticipate,” Mascarin said. The Toronto lawyer said Ford would first have to resign. “Council has to make a decision. Do they appoint somebody or do they run a byelection? They could very well decide that they want to run a byelection and Doug Ford can run … They could decide to appoint someone and that person could be Doug Ford,” he said. Ford told CP24 Saturday that he would consider stepping down but only if council would guarantee he would have a chance to reclaim his seat in a byelection. “My fear is I won’t get my seat back … once they open it up again, anyone could be appointed to my seat,” he said. “If they would obviously say yes, we will have a byelection after September 1st, absolutely I would step down tomorrow, have Doug step in if there is a way of him doing that,” he said. 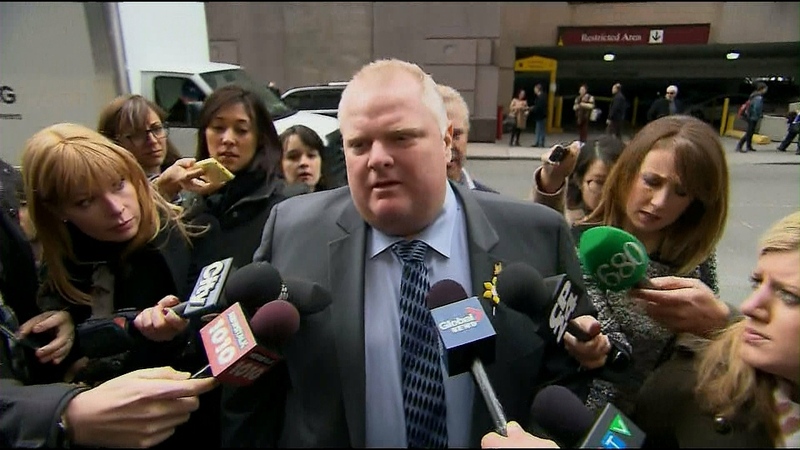 Rob Ford arrives at Mount Sinai Hospital in this file photo.